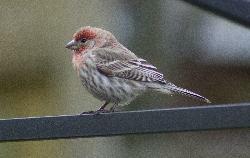 Photo of Common Redpoll bird. Taken in Ontario Canada. Finch - Female Common Redpoll in Ontario back yard.